Directions are for Misses’ size Small/Medium. 14 sts and 20 rows = 4 in. with Skacel ANTONIA and larger ndls in Pat I. 11 sts and 20 rows = 4 in. with Skacel ANTONIA and larger ndls in Pat II. Row 1 (RS): *K 2, p 3; rep from * to last 2 sts, k 2. Rep Rows 1 & 2 for Pat I.
Rep Rows 1 & 2 for Pat II. Row 2 & all WSRs: Purl. Row 3: K 11, *DD, k 11; rep from * to end. Row 5: K 10, *DD, k 9; rep from *, end last rep k 10. Row 7: K 9, *DD, k 7; rep from *, end last rep k 9. Row 9: K 8, *DD, k 5: rep from *, end last rep k 8. Row 11: K 7, *DD, k 3; rep from *, end last rep k 7. BACK: With larger ndls and MC, CO 97 sts. Fold hem: Work 11/2 in. St st, ending with a RSR. Knit one row for turning ridge. Work Pat I until piece meas 21 in. above turning ridge. Dec row (RS): *K 2, sl 1, p2tog, psso: rep from * to last 2 sts, k 2 – 59 sts. Next row: Purl. Cont as est in Pat II until piece meas 281/2 in. above turning ridge. 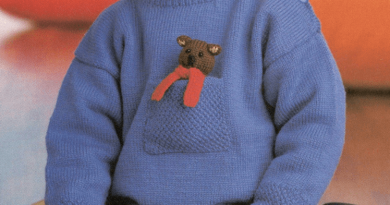 Shape armholes: BO 4 sts beg next 2 rows. Dec 1 st each side every RSR twice – 47 sts. Cont in Pat II until arm-hole meas 91/2 in. Place sts on a holder. With larger ndls and MC, CO 47 sts. Work fold hem same as Back. Work Pat until piece meas 21 in. from beg. Work dec row same as Back – 29 sts. Cont in est Pat II until piece meas 281/2 in. above turning ridge, ending with a WSR. Shape arm-hole: Next row (RS): BO 4 sts at beg of row, finish row. Next row: Purl. Dec 1 st beg of next 2 RSRs – 23 sts. Cont in Pat II until armhole meas 8 in., ending with a RSR. 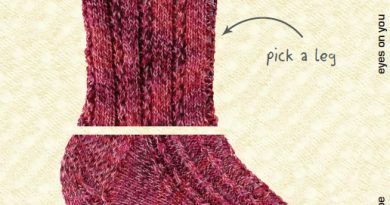 Shape neck: BO 4 sts at neck edge on next row, then dec 1 st at neck edge EOR twice – 17 st rem. Cont until armhole meas same as Back. Place rem sts on a holder. Work same as Left Front, rev shaping. 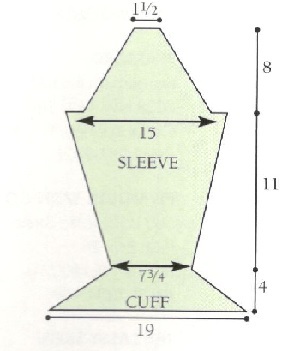 SLEEVES: With larger ndls and MC, CO 67 sts. Work 2 rows in garter st (= k every row). Work 12 rows of Spoke Point Ruffle pat – 27 sts rem. Work 6 rows in garter st. Work in Pat I inc 1 st each side every 4th row 8 times, then every 6th row 5 times – 53 sts. Cont in Pat I until piece meas 15 in. above cuff. Shape cap: BO 4 sts at beg of next 2 rows. Dec 1 st each side every RSR twice. Cont dec 1 st each side every 4th row once, then every RSR until 9 sts rem. BO 2 sts at beg of next 2 rows. BO rem 5 sts. 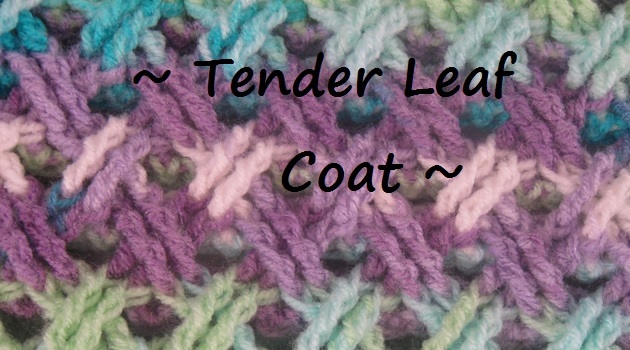 FINISHING: Join shoulder seams using 3-ndl method as foll: Work 17 shoulder sts tog from Front and Back holders, place next 13 sts from Back neck on a holder, work rem 17 sts tog from Front and Back holders. Collar: With RS facing, PU and knit 9 sts at neck edge, knit 13 sts from Back holder and PU and knit 9 sts from neck edge – 31 sts. Work 3 in. in St st, end with a RSR. Knit one row for turning ridge. Work 3 in. in St st for Collar. BO. 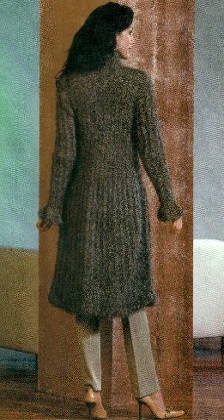 Folded cord facing: With RS facing, PU and knit sts evenly along Left Front edging from hem to neck. Work 11/2 in. in garter st. BO. Work same facing on Right Front edging. Sew in Sleeves. Sew side and Sleeve seams. Fold BO edge of Front cord facing to RS and sew down at PU row. Fold collar to inside, sew sides and stitch BO edge to inside. Fold bottom hem at turning ridge and sew to inside. 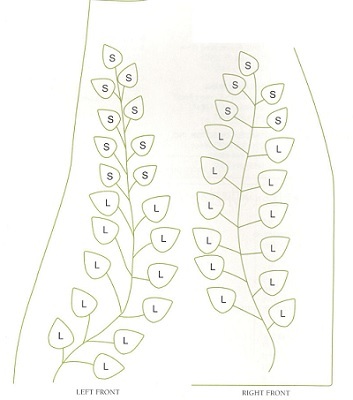 Work Leaves as indicated below and sew to Fronts of Coat foll diagram. SMALL LEAVES (make 14): With small­er ndls and CC, CO 5 sts. Row 1 (RS): K 2, yo, k 1, yo, k 2 – 7 sts. Row 2 & all even-numbered rows: Purl. Row 3: K 3, yo, k 1, yo, k 3 – 9 sts. Row 5: Ssk, k 5, k2tog – 7 sts. Row 7: Ssk, k 3, k2tog – 5 sts. Row 9: Ssk, k 1, k2tog – 3 sts. Row 11: SI 1, k2tog, psso – 1 st. MEDIUM LEAVES (make 23): With small­er ndls and CC, CO 5 sts. Row 1 (RS): K 2, yo, k 1, yo, k 2 – 7 sts. Row 2 & all even-numbered rows: Purl. Row 3: K 3, yo, k 1, yo, k 3 – 9 sts. Row 5: K 4, yo, k 1, yo, k 4 – 11 sts. Row 7: Ssk, k 7, k2tog – 9 sts. Row 9: Ssk, k 5, k2tog – 7 sts. Row 11: Ssk, k 3, k2tog – 5 sts. Row 13: Ssk, k 1, k2tog – 3 sts. Row 15: SI 1, k2tog, psso – 1 st.